Woodbridge Place offers spacious, wooded estate lots for the homeowner who places a premium on “personal space.” Resting in one of the area’s most desirable locations off Covered Bridge Road in Prospect, Woodbridge Place is within a reasonable driving distance to shopping, dining and entertainment. Woodbridge Place is highly sought after by those who relish a home in a prestigious area, yet cherish privacy in a natural setting. Lots start at $220,000 and range from two to five acres. 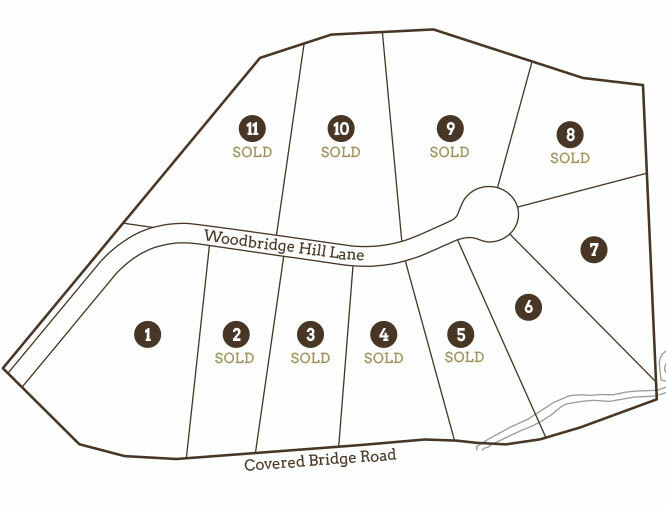 With only three lots left, we strongly recommend contacting us today to reserve your best choice. Woodbridge Place ensures the quality and integrity of the homes and neighborhood through rigorously defined deed restrictions. Stringent material and construction standards are evidenced by our select roster of approved builders. If you are a builder who is interested in becoming an approved builder for Woodbridge Place, please email us. If you would like more information on building your new home in Woodbridge Place, please click below. Remember, only three lots remain... so call today!